Preparing the Soil (Part 8) - Perelandra Ltd. The promise of spring has us itching to get outside and get our hands in the dirt. Before you run out to buy a bunch of fertilizers and a new tiller, talk to your partner. This week, you're going to find out exactly how you need to prepare your soil. When you get this information from nature, it will be tailored to your garden, its purpose, the plants and seeds that you've determined will go in, your soil and your environment. Nature knows best what's needed for balance when it comes to your soil. We encourage you to break this into two testing sessions this week. Before you begin, get out a calendar, pen and paper, or open your computer if you are keeping your notes there. You will be reading the same pages as 2.0 Gardeners in order to learn the questions to ask. Continue following your gut (intuition) and any clues you notice to get your information. 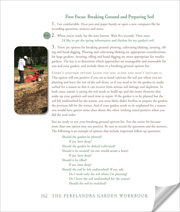 Start by reading the Garden Workbook from the top of page 162 through Step 4 on page 163. Now you have the questions to ask about how you'll be preparing your soil. Hit that start button and ask! That won't take too much time. So after you have that information, prepare your fertilizer options list. Read pages 171-172, through Step 6, then do it. Once you have this list, your next session will be a breeze. Now you'll be asking nature if you are to fertilize in the spring and how much of each fertilizer you need in each section of your garden (if your garden is divided by sections), or in each pot and railing box if you have a container garden. 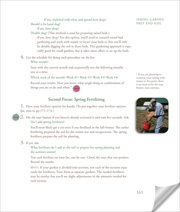 You'll also find out the schedule for fertilizing, so make sure you have your calendar handy before you begin. Go to page 163, "Second Focus: Spring Fertilizing." Yay! You've already completed Step 1. So start at Step 2. You'll be reading and following the instructions/questions through the middle of page 165. Your last questions are exciting. Read "The Big Question" in the middle of page 165. Hint: If you work during the week and only have time to work in your garden on the weekends, tell nature that. When you are testing soil prep and fertilizing schedules, only ask about those days you are available to do the work. There you go. Now you'll know just what you need to prepare your soil for the coming season. When it's time to get your hands in the dirt, you'll be able to relax your mind and just enjoy the work. You should have your seed starting charts well underway, your supplies ready to go and be setting up your seed-starting area. A greenhouse isn't required. You might be starting plants on a shelf by a sunny window. A little trick Machaelle told us she used when she was just starting to garden: The top of a water heater is a perfect place to start a flat or two of seeds. It's usually in the dark and provides just enough warmth to encourage sprouting. (Be sure to move them out of the dark when they germinate!) If you just want to try your hand at starting a few of your seeds ahead, this is an easy way to begin, with no special equipment needed. There are plenty of other ways to improvise. If you're stuck for ideas, ask nature for help. You can probably find all sorts of options and ideas on YouTube! Just be sure to ask nature which of those are right for you. Your guide to working with nature in a greenhouse or in your seed-starting space is Chapter 8, beginning on page 143. 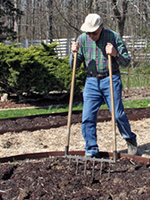 Preparing the soil for the plants you start indoors is just as important as the garden soil. Instructions are on page 150. Since we're not going into full detail on the greenhouse process here, please don't hesitate to call the Question Line if you get stuck. We'll help you out.